Regarding the exact match of the domain, that is true. But then you've got to compete with the other TLDs. creditcards.com or creditcards.ca? Well, they've both got the bolded keywords in the search results... So they should both have the high CTR and lower click cost. Right, and that is part of the reason I feel many non .com domains are underpriced. Aaron do you think it's just the .org and .net (and country specific) TLDs that are under priced? What about extensions like .biz, .info, and other less popular extensions. Think .mobi will gain use for mobile content? I have an iPhone, and thus think .mobi is unneeded. In the US those who NEED to access the web on a mobile device are also the same people who can afford an iPhone and don't need .mobi. Abroad I don't see .mobi becoming huge either because in some countries even their associated ccTLDs have not gained tons of support. I think many of the country code domains offer great opportunity for investment, especially if you live in the country and know the local culture. I think .biz just feels a bit sleazy and cheap. 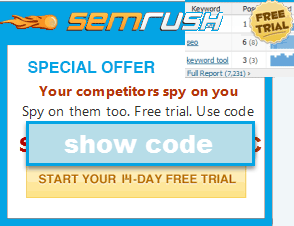 Getting quality links to a .biz is going to probably be harder than getting similar links to a .net or .org or .com. Google tries to equate "of commercial intent" as being associated with "spam". So .biz is in the hurt locker just based on that. Some single word and two word .info domains might be worth picking up, but I don't see it as flourishing to the level of .net, .org, or .com. .com rocks because it is the universal default. some .org domains have a halo effect around them. .net is also good because it is quite widely used. "Rock Hard With Cheap Viagra"
hehehe. It would be hard for people to refuse so many good offers. Google has not fixed their own sitelinks. 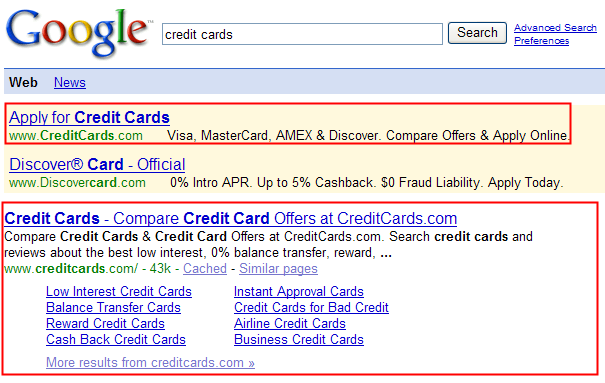 I found this post on a blog this morning about the Adwords sitelinks including a link to the FireFox landing page. It also has a link to Gmail. What makes the Site links show up. If you type the key words jumbo cd investments into the search box, our site comes up first, but we don't get any sitelinks. If Google thinks the query is navigational in nature, has a high probability of being brand related, or if there is one site that has far more signs of relevancy and quality than all others. They may look at clickthrough rate data, linkage data, domain name, brand related searches, and a variety of other potential quality signals. I am looking at the results for one of my generic domain names. The .org is #1 on Google, they get all of the sitelinks, my .com is #2. Domainers can't expect #1 listings to magically appear without doing some serious work on the SEO side. On the plus side for me, I benefit from all of the traffic that the visitors meaning to go to the .org type in .com instead. They can't expect #1 with no work, but they can typically get somewhere in the mix of the top results without as much work as it would take if they had something other than the exact match domain. 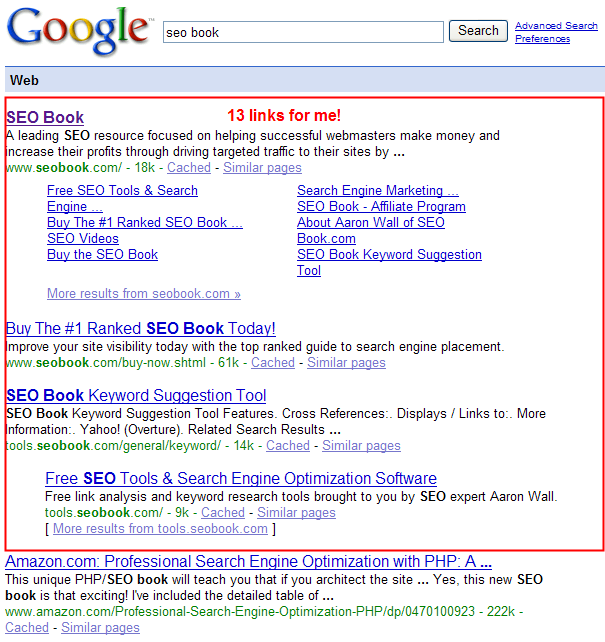 Search Google for seo book and look at some of the other exact match domains ranking in Google. Look at the quality of the .name or the .org.uk and see if they are better than the other 169,000 pages that contain the phrase SEO Book. Aaron, you suggested that Google "may look at clickthrough rate data, linkage data, domain name, brand related searches, and a variety of other potential quality signals." Our website Voices . com is a great name, very old (1998) and ranks #1 for the ultra generic word "voices", yet we can't seem to achieve sitelink status. Other than the above suggestions at what Google may consider, is there a specific areas of quality to focus on? Would you say on-site adjustments could have an effect or simply building more links is the ticket? I would probably consider hiring a public relations firm and building more links.